Let’s cut right to it. This is a GREAT album. Italy’s Fake Heroes understand the importance of writing great songs. At the end of the day, no matter how clever your rhythms are or how complex your riffs are, if you can’t write a memorable song, there’s really no technical ability that can save you. Fake Heroes do have the technical ability. The riffs are always complex but VERY melodic and fit the music perfectly. Guitarists Gianni Vespasiani and Simone Del Libeccio are the keys to those riffs which at times are somewhat djent, yet like the band Vola, they are not hung up on being strictly rhythmic. In fact, Fake Heroes (again like Vola) take the thick sound of djent and push it into extremely melodic territory. Another major factor in the success of “Clouds” is the high-octane vocals of Manuel Gatta, who not only has a VERY strong voice but knows when to hold a note and when to pick it up quickly. The chorus of “The Beginning of Thought” comes to mind. “The beee-giiiiiiiining…” If you aren’t singing along with songs like that one or “Lifelong Addiction” or the title track, you are dead inside. Another reason this album is so amazing is the sequencing. Fake Heroes understand how an album should flow, song to song. They also make sure that one song goes right into the next one. Don’t let up! One example is how “Lifelong Addiction” suddenly winds down and “Skyline” then kicks in and rips your head off. Absolutely perfect. I also should mention the band’s incredibly tight rhythm section of bassist Zack Cetrullo and drummer Mike Santoleri who round out this top notch band. Fake Heroes take the song oriented prog sensibility of countrymen Kingcrow and merge it with the equally song oriented approach of Vola to create their own sound. And as great as both albums by those two bands are, “Clouds” is every single bit their equal. Modern prog done correctly. While everyone has been praising TesseracT for advancing the cause of djent, bands like Fake Heroes have prevented it from becoming the parody of itself that it is in danger of becoming. 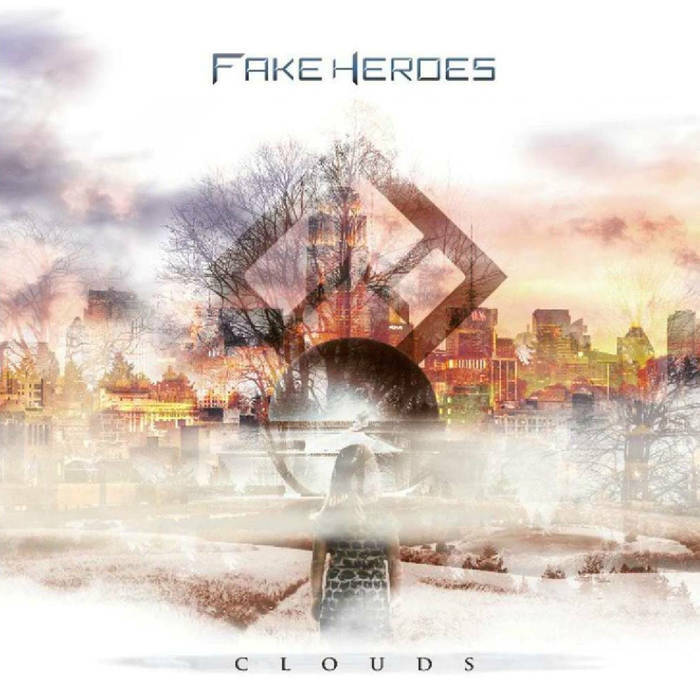 Fake Heroes are a very talented group, who push all the right buttons on this album. “Clouds” plays like a greatest hits album of a band that’s been around for many years and yet it’s all new and so incredibly fresh. Saying that “Clouds” is a “must-have” is a huge understatement!! Save your pennies and BUY this one.